paul gregutt's washington wine blog – unfined & unfiltered: wine rocks! The wine business is loaded with musicians, and I don’t mean celebrities who have parlayed rock star status into winery ownership. I mean winemakers and wine sellers who are also talented musically – people like Bob Foley, whose Robert Foley Band tours nationally; and Kermit Lynch, who has a new album out this month. My own history as a guitar picker/performer goes back much farther than any work as a wine writer – or any kind of writer for that matter. I began writing songs in college, and following that I worked for a summer at Electric Lady Studios in New York. My roommate was an engineer there, and I was an assistant engineer. The studio at the time was the hippest place to be in Manhattan, with Stevie Wonder, Led Zeppelin, Delaney and Bonnie, and a pre-Kiss lineup (same players) called Wicked Lester among the musicians who recorded there during my brief tenure. After putting the guitar down for a number of years, I picked it up in earnest a decade ago, and it has been a particular pleasure to begin performing again. Today on Part 3 of KUOW’s series on the crush, you can hear a snippet of a song I wrote about wine, and in a few weeks I’ll play that song and a number of others at an event in Seattle called Wine Rocks. 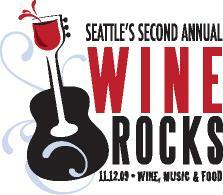 Wine Rocks is one of a number of annual events mixing great wine, winemakers, and winemaker/musicians. My participation in these events raises a number of interesting questions. Am I being compromised by having a musical relationship with people whose wines I also review? You could certainly accuse me of that, though I am careful always to admit that I place a high value on the personal relationships that wine writing fosters, and do not subscribe to the notion that I must build an impenetrable wall between me and the people who make and sell wine. What is the connection between wine and music that lures so many musicians into wine, and vice-versa? I think that the two are very complementary. Playing music takes your mind into a special, highly-focused place, a really fun place where you can linger for hours on end, without effort or fatigue, especially when performing. For me it is the perfect counterpoint to writing, which is requires organized, logical thought. Music uses a totally different part of my brain, and I imagine it is the same for winemakers who play. For me, who has been privileged to be a critic/journalist/reviewer for most of my working life, getting onstage and hanging it all out in front of live audiences has shown me the other side of the coin. I deeply understand the mix of terror and exultation that live performing can evoke in anyone bold enough to show their most personal and fragile self to a critic. So far I’ve been spared a “review” of my music, but some day I’m sure someone will take up that task, and it may not be kind. I’m ready for it, I suppose. But if nothing else, performing reminds me to be as kind as possible when being critical. Someone’s wine is just as precious and special to them as one of my songs is to me. Criticism is necessary, especially informed criticism, but it is best, I think, when it comes with a great deal of respect for the time, effort, work, talent, passion and sacrifice that has preceded the finished product. Balboa, Barrage Cellars, Boudreaux Cellars, Brian Carter Cellars, Chatter Creek, Cuillin Hills, Des Voigne Cellars, Donedei Cellars, Efeste, Eliseo Silva, The Ellensburg Distillery, Gamache Vintners, Ginkgo Forest, Hightower Cellars, JM Cellars, McCrea Cellars, Sleight of Hand Cellars, Sparkman Cellars, and Tagaris.